Concerns continue over honeybee demise. “Just move slow around them, and they’ll be fine,” Gary Clark assures me as I slip into a white jumpsuit with attached hood. It’s standard attire for beekeepers, but this is the first time I’ve donned the getup. As he opens the hives, he checks each feeder and adds sugar water if needed. The sugar water is a nectar substitute that helps sustain the bees in the cooler months when hives aren’t producing as much honey. When he removes the lids, the bees inside are active despite the cool air outside. Individually, each bee is cold-blooded. As a group, however, they keep the ambient temperature of the hive around 94 degrees to keep the colony thriving. Inside, each hive box is divided by slats that are artificially honeycombed to encourage the bees to make honey. The honey feeds the hives and serves as a food product that humans have consumed for 8,000 years. I can tell by the way that Clark cares for the insects that beekeeping is a personal affair. He talks to them softly while removing the broad frames where the bees make honey. In their symbiotic relationship, Clark provides a suitable home in which the semi-domesticated bees live, and in return, the bees collect local nectar from flowers and trees and bring it back to the hive where they regurgitate the hydrolyzed nectar to produce honey. While the bees are out collecting nectar, pollen sticks to their electrostatically charged legs and bodies. As they fly from flower to flower, pollen is collected from one plant and deposited in another, thus aiding plants in their asexual reproductive efforts. Bees and other pollinators are key to today’s lucrative nut and produce business and play a vital role in putting food on our tables. The honey is made continually back at the hive, where it is used for both short- and long-term food supplies for the hive with plenty to spare. That’s why beekeepers like Clark are able to harvest significant amounts of honey and still have thriving bees. By all accounts, Clark’s hives are healthy. Now that he’s fed them a diet of sugar and water to tide them over while trees and plants aren’t flowering, they’ll make it through the winter in good shape. However, over the past several years, many bee colonies like Clark’s haven’t fared so well. Beekeeper Gary Clark holds a frame that's filled with honey produced by his bees. Over the past decade, bees have experienced a precipitous decline in their numbers. By most accounts, bee populations are declining at a rate of 33 percent annually. While that’s alarming, beekeepers are generally able to stave off some losses by splitting remaining hives and starting anew. That’s little solace to those in the beekeeping community who worry about the future of bees, however. The historical trend lines paint a bleak picture: Honeybees have been disappearing to some degree since right after World War II. Marla Spivak, a renowned apiculturist with the University of Minnesota, said in a 2013 TED talk, “The bottom line is, bees dying reflects a flowerless landscape and a dysfunctional food system.” Spivak believes that bee decline coincides with the rise in monocultural agricultural practices in which food (like corn and soybeans) chiefly produced for humans and livestock doesn’t provide the pollen needed for honeybees to thrive. When pesticides are used on these crops, the threat to honeybees, according to Spivak, increases greatly. To date, however, no scientific cause for CCD has been proven. Many scientists believe that CCD is caused by a variety of damaging factors with which honeybees must cope. Viruses, fungi and a particularly damaging parasite called the varroa mite are only a few of myriad afflictions that affect bees, in addition to the challenges caused by the lack of diverse pollen sources. A 2014 Harvard study links CCD to a class of pesticides known as neonicotinoids, a nerve poison used to control insects on most commercially grown crops in the United States. According to the paper’s authors, their research supports “the conclusion that sub-lethal exposure to neonicotinoids is likely the main culprit for the occurrence of CCD.” The researchers conclude that this class of pesticides may impair the bees’ ability to find their way back to their hives. Skeptics argue that the Harvard paper doesn’t use a big enough sample size to be deemed conclusive. Therefore, the mystery remains. Honeybees converge on a synthetic honeycomb to begin the honey-making process. Honeybees are an integral part of the agribusiness infrastructure, as bees pollinate around 130 crops that have an annual value of $15 billion. 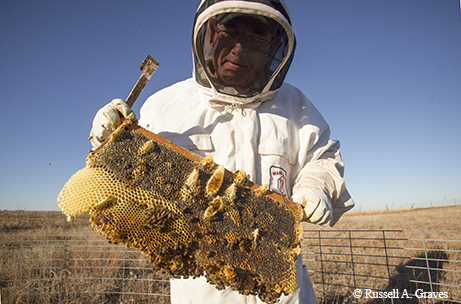 “One out of every three bites of food we take is pollinated by honeybees,” says Bob Richie, a Dallas-based architect who is a beekeeper, a rural landowner, a certified Texas Master Naturalist and the president of the Trinity Valley Beekeepers Association. His affinity for bees goes back to when he was a youngster, and for 42 years, he’s stayed engaged with the eusocial insect. Richie says he currently keeps 10 hives of bees on his Mason County ranch and another five in his backyard in Dallas. Because of the complex nature of honeybee colonies, his fascination is one that’s been shared by humans for thousands of years. Bee culture is a matriarchal one. Females, of course, serve as the queen, the epicenter of the hive. After being bred by male drones, the queens lay up to 2,000 eggs a day to continually replenish the hive numbers. 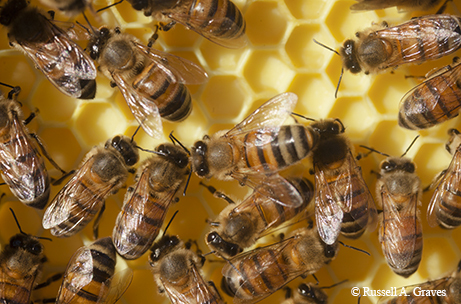 Female worker bees make the honey. The worker bees live together in a cooperative yet complex society that is made up of 20,000 to 80,000 individuals, has no central authority and advocates the survival of the colony over all else. To that end, the female workers continually look for sources of food to sustain the colony. When a food source is located, worker bees perform a “waggle” dance that informs other bees precisely where to find the food. Their collective efforts result in them producing as much as 74 pounds of honey per hive per year. In addition to honey, bees also produce beeswax that is used in candles and lip balms as well as various other cosmetic products. Honeybees also make a product with antifungal and antimicrobial properties. Known since biblical times, propolis is the material bees use to seal honeycomb cells and has been used by humans in natural medicine for years. Moreover, it’s currently being researched by scientists for its efficacy in a wide-ranging variety of maladies, from treatment of burns to cancer. In short, bees serve as a linchpin that quietly keeps our modern society together in ways that most people never consider. The bees go about their business as they have for thousands of centuries. Although their demise is a genuine cause for concern as of late, the Agricultural Research Service reports that the declines are slowing. That doesn’t mean that CCD is over, however, and beekeepers like Gary Clark, Bob Richie and others remain vigilant in the face of the decline. They have to. The bees are depending on them.